Lunch has been quite strange for me since starting the new school year. There are about 8-10 of us that eat together, but more than half of them have changed this year. The previous teachers were all really nice to me and had already learned about my likes and dislikes (regarding food). Even though I ate in silence, it was very comfortable. Now, I’m going through the learning curve all over again. The teachers talk about me a lot more (in Korean) and always seem to be worried about how little food is on my lunch tray. Lately, a few have been saying “Hi!” to me and then the others giggle. I had a really interesting lunch experience today. The lunch options weren’t that great for me. I am usually always able to eat rice if nothing else appeals to me, but today’s rice had mysterious white strips in it. 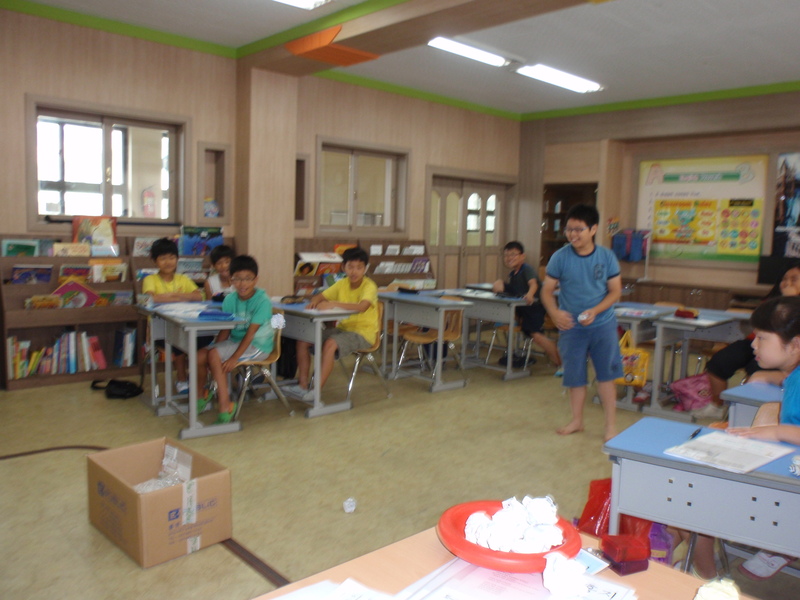 When I sat down, I asked JuHye if it was tofu or fish cake and then the other teachers were so curious about what we were talking about. 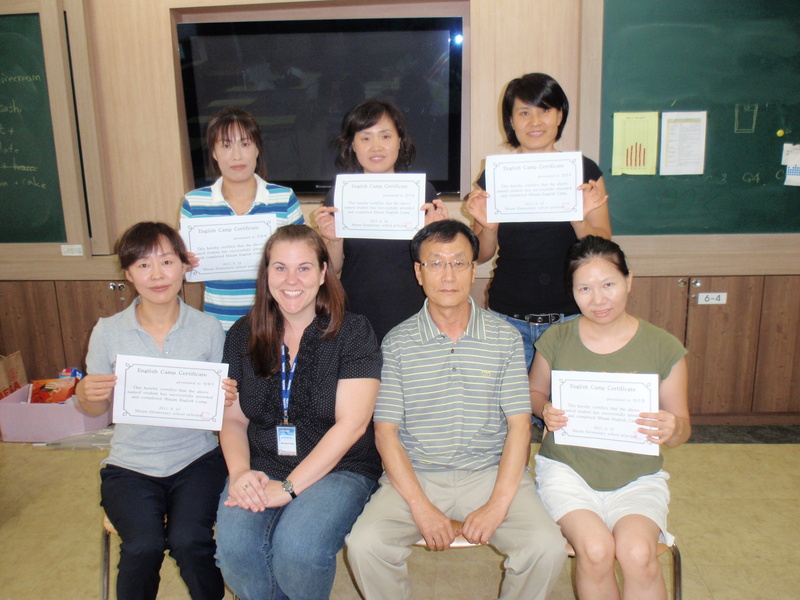 As it turns out, it was fish cake and the teachers learned a new word (In Korea it’s 오뎅, or oh-deng). It was really cute because I heard them saying “fish cake” all throughout lunch. 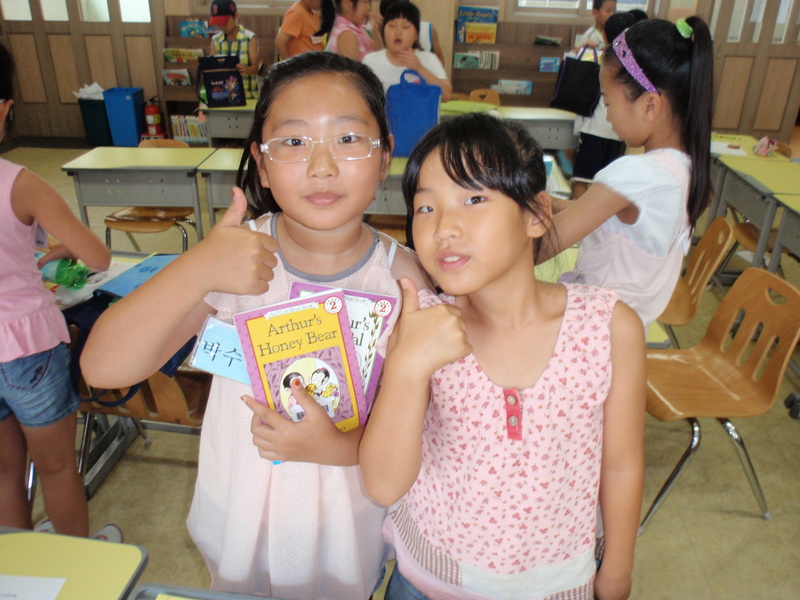 As I was picking at my lunch, JuHye turned to me and said, “Meagan, they would all like to introduce themselves to you.” They all went around the table saying, “My name is _____.” and what they did at school. JuHye translated the last bit. I honestly think it was the most English I’ve heard at lunch since I’ve been teaching in Korea. It was really sweet and I enjoyed it. Today is the first day of the school year. The first day last year was a crazy day. First, all of the new teachers were introduced to the entire school through the morning TV announcements. Later, I was introduced to an auditorium full of parents. In both situations I had no idea what was being said. I just waited until I thought the principal was done talking about me and bowed. The actual opening ceremony was outside and I was asked to hand balloons to the 6th graders (who would later pass them on to the new 1st grade students). I was given a giant bundle of balloons and had to pass them out, one by one. I was terrified of accidentally losing one or all of my balloons and was passing them out slower than they liked. I knew this because about 3 teachers rushed over to help me. I was proud of myself. I only lost one balloon. Today’s events were much more relaxed for me because it’s my second year and I no longer qualify as a “new teacher.” Also, the opening ceremony was indoors and didn’t involve any balloons (thank goodness!). 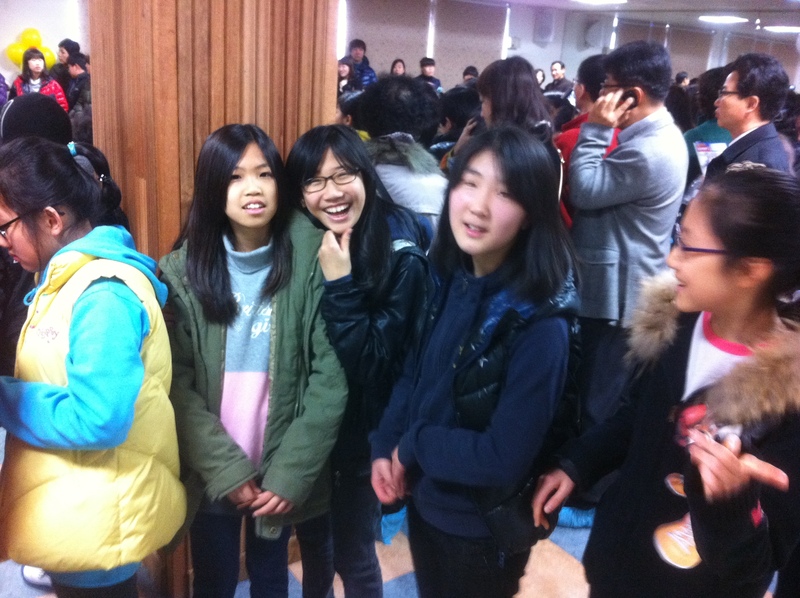 The school’s auditorium was full of 6th graders, 1st graders and the parents of the 1st graders. One of the mothers that attended my summer and winter camps was so excited to see me. She came up, shook my hand and said, “Long time no see!” It was cute. I really like her. I’m not really sure what the opening ceremony consisted of. The 6th grade students each escorted a 1st grade student into the auditorium. Later, each 1st grade student was called to the stage and they were given some sort of necklace and a hat. It was really difficult for me to see because the auditorium was full of proud parents with their cameras at the ready. JuHye and I sneaked out a bit early, but I did manage to snap a few pics. Here are a few of my 6th grade girls. They were too amused by my iPhone to pose for the picture. Some of the 1st graders at the ceremony. 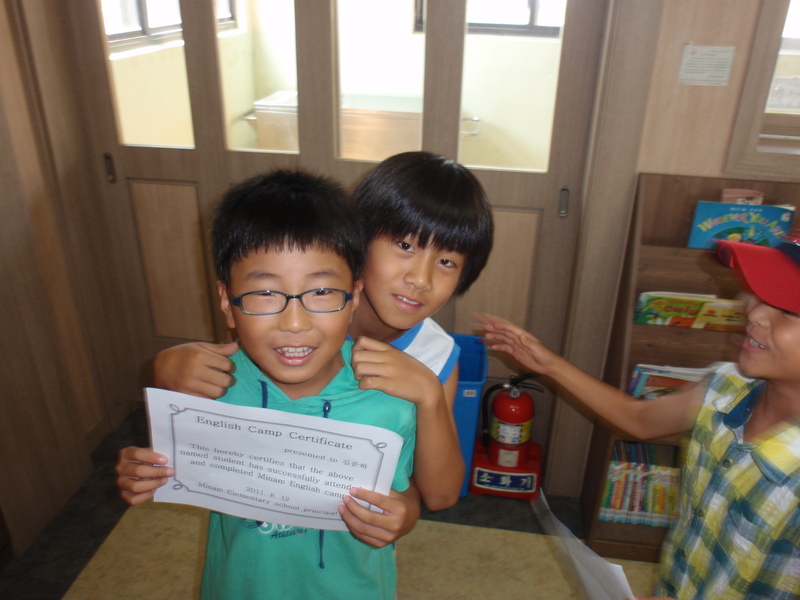 Also in the picture are my principal and new co-teacher. I have to wear indoor shoes at school. 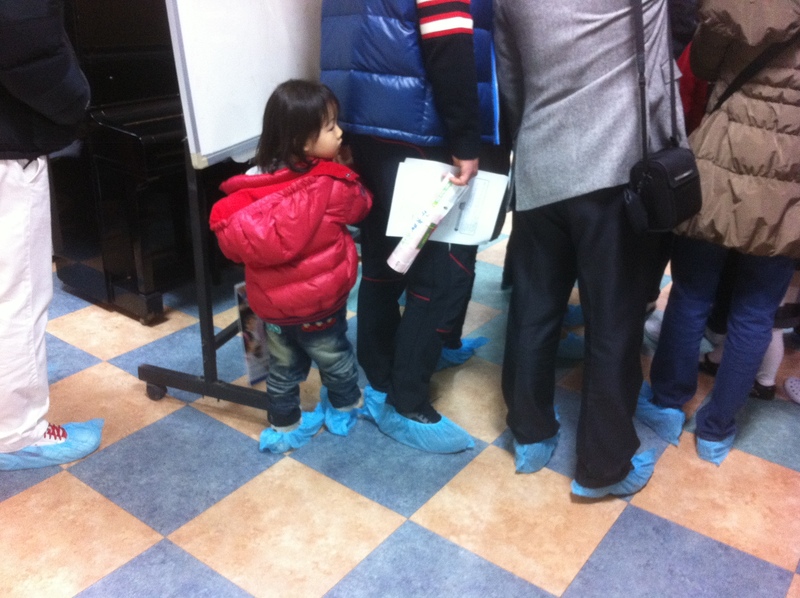 When we have events, the parents are allowed to wear their outdoor shoes, but the school provides little booties for everyone to slip over their shoes. 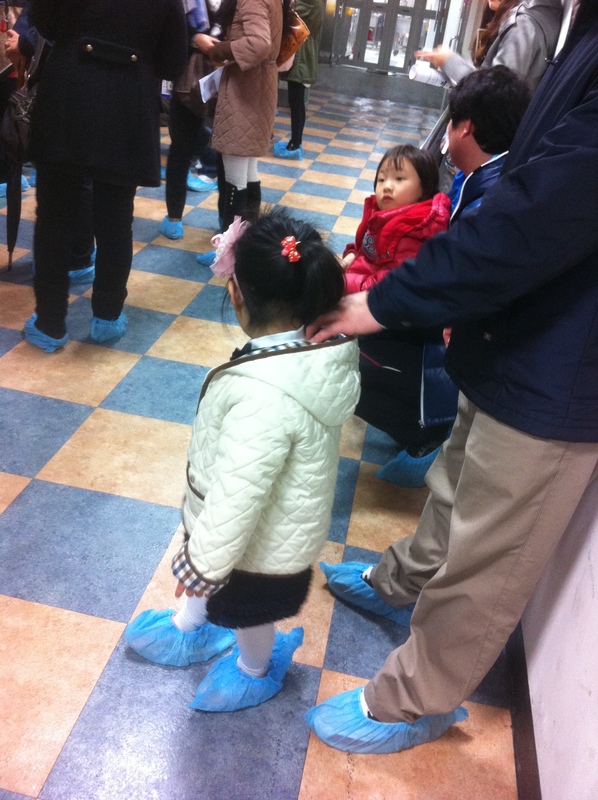 I found these little girls to be extra adorable in their booties. 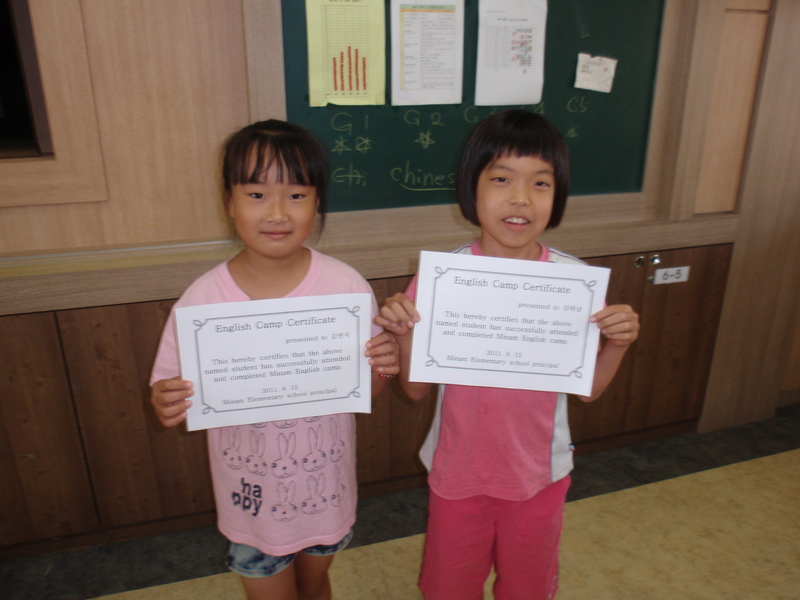 During week 2 the students “graduated” camp with certificates from the vice principal. On the last day of camp, the vice principal also invited the 3rd and 4th graders to come back to camp the following week along with the 5th graders. For me, this meant I had to make all new lesson plans at the last minute. In the end, everything went well and I had a great time at camp. But I am glad that I don’t have to do that again until the winter! 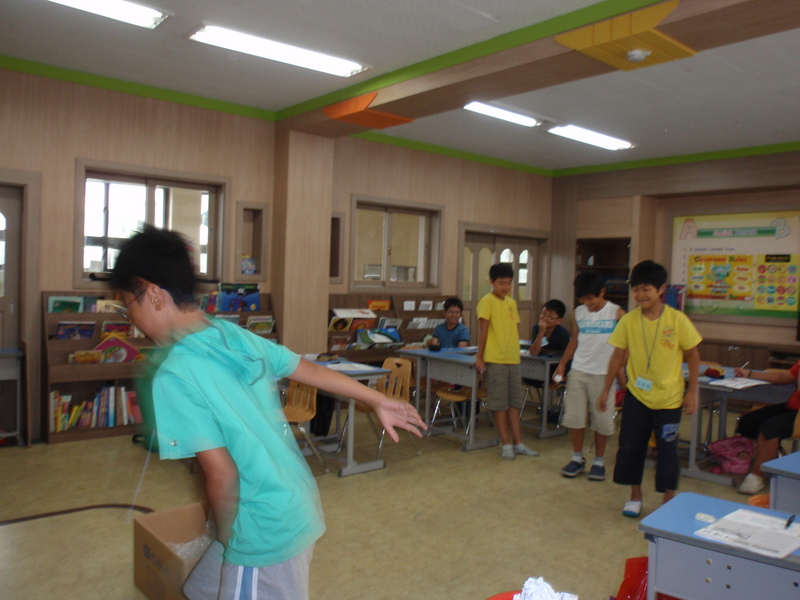 We played a “Trash Ball Game.” The students answered questions for a chance to throw wadded up paper into a box. These boys said the book was easy so I made them read it to the class. 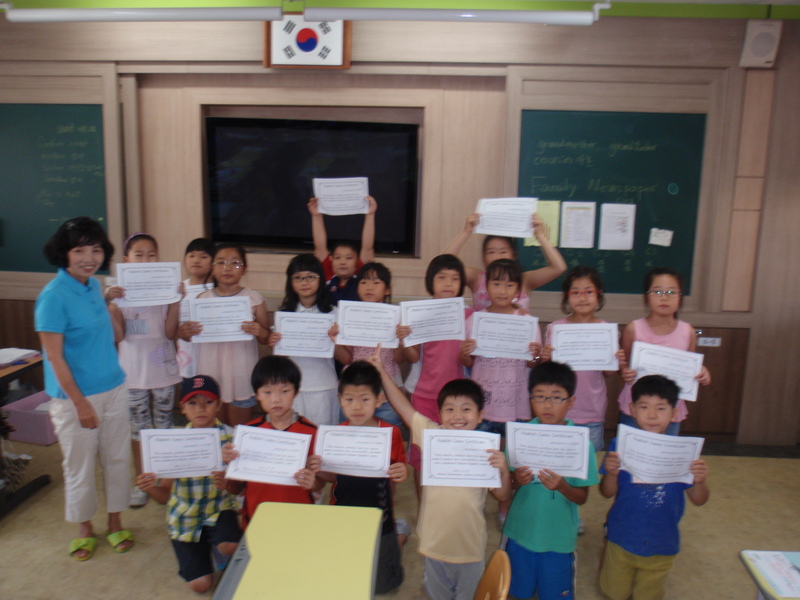 During week 3, the principal handed out the certificates. 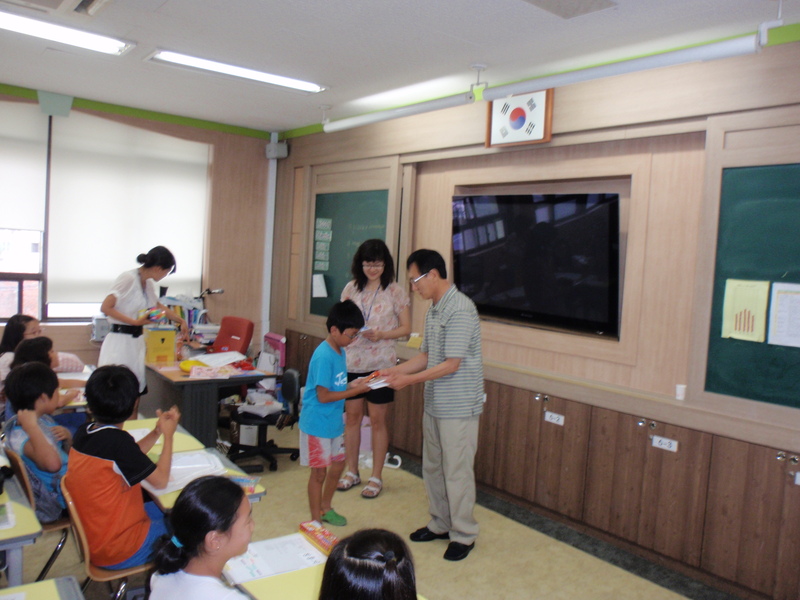 We also gave certificates to the parents. It’s over!!! One week down, two to go. 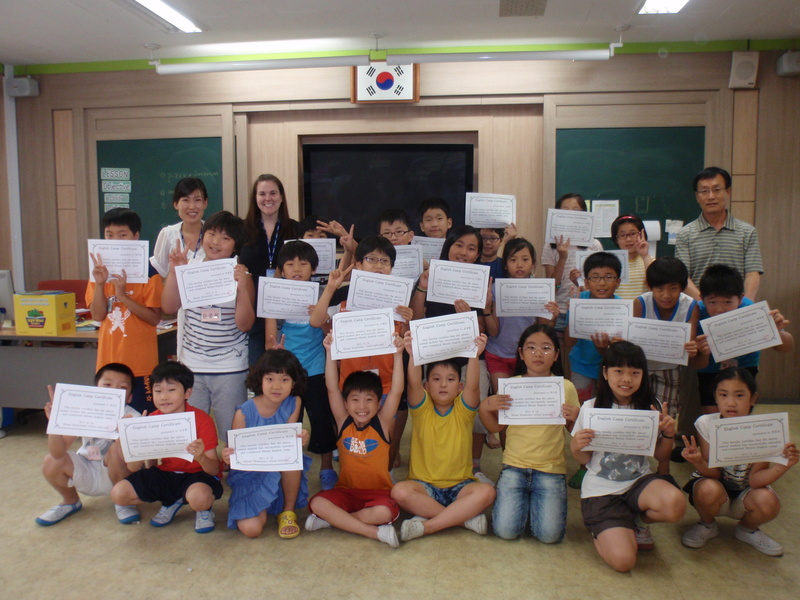 Most elementary English teachers in Korea have to teach 3 weeks of summer camp after the regular semester ends. As I previously mentioned, during the first week I taught 1st & 2nd graders. In my school, the students don’t begin learning English until the 3rd grade so this was my first time to teach the little ones. It was a challenge! They are soooo full of energy and their attention span is so short. They were all really excited about camp though. They were always in a good mood and very enthusiastic. They tried to try to talk to me in Korean quite a bit and I had no clue what the heck they were saying. They probably felt the same way when I was talking to them. I did have a pretty high level student in one of my classes that always listened very closely when I would talk and then he would say, “Ok, ok, ok!” and translate what I said to the rest of the class (even if they didn’t need it). It was pretty funny. Thursday – How are you? I don’t have camp next week so I will be sitting at my desk all day Monday and Tuesday. I’ll probably prepare for lessons… or watch movies. I have Wed – Fri off so I’ll probably go to the beach if the weather is nice. I am also thinking about doing a temple stay (at a Buddhist temple about 2 hours away) with one of my friends. Camp starts back up again on August 8th. I’ll be teaching 3rd & 4th graders. Wish me luck! 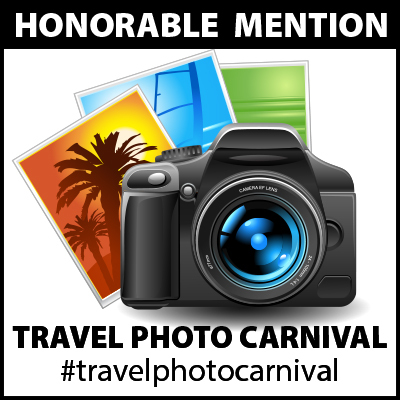 You can view the pictures below. Click on any photo to see a larger image. These were the most active of ALL of my students! They are so cute, but so exhausting! They thought this was sooo funny! 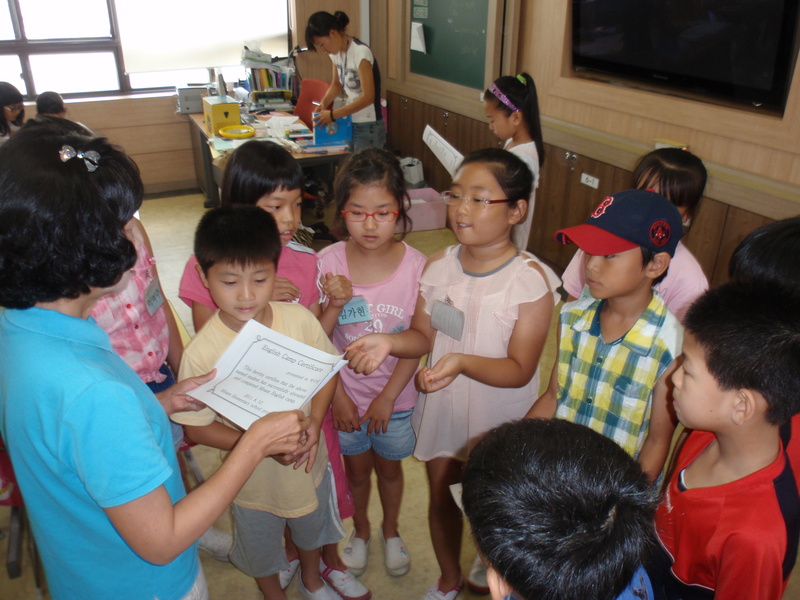 I am pretty sure that I mentioned before that I am teaching a parents class during summer camp. I change elementary students every week, but the parents class is the same parents all 3 weeks. They are really nice ladies and I am happy that the two women that I thought might drop out of the class are still coming. 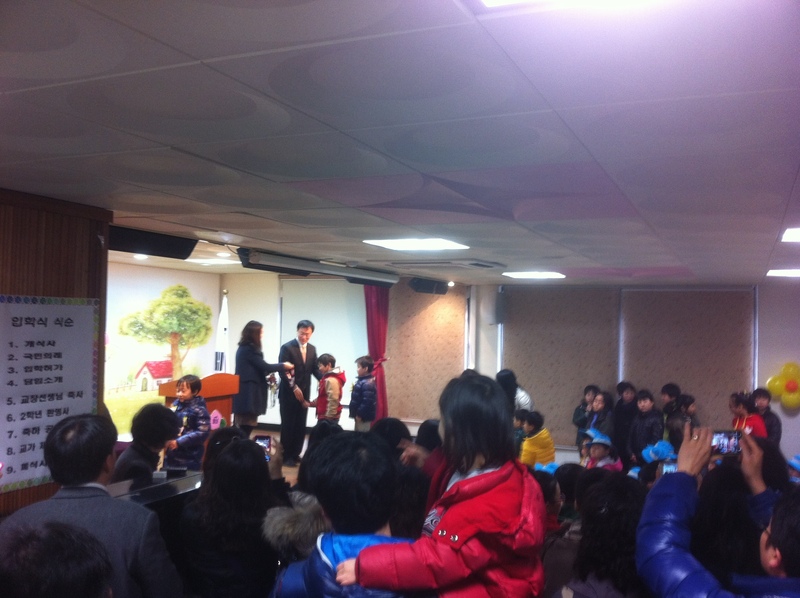 There are 2 teachers for the parents class, JuHye and myself. JuHye’s class is supposed to run from 2:00 – 2:40 and my class is from 2:50 – 3:30. 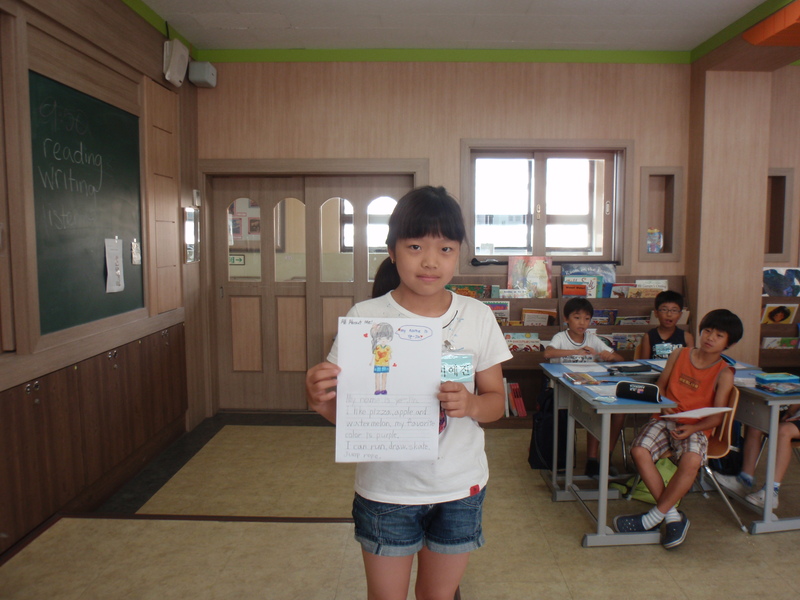 The vice principal was worried that the parents wouldn’t feel comfortable in a classroom with just me (because of the language barrier) so she suggested that JuHye and I teach together. We did that for the first few days, but if we do it consistently then it will put me over my teaching hours so it won’t really work out. 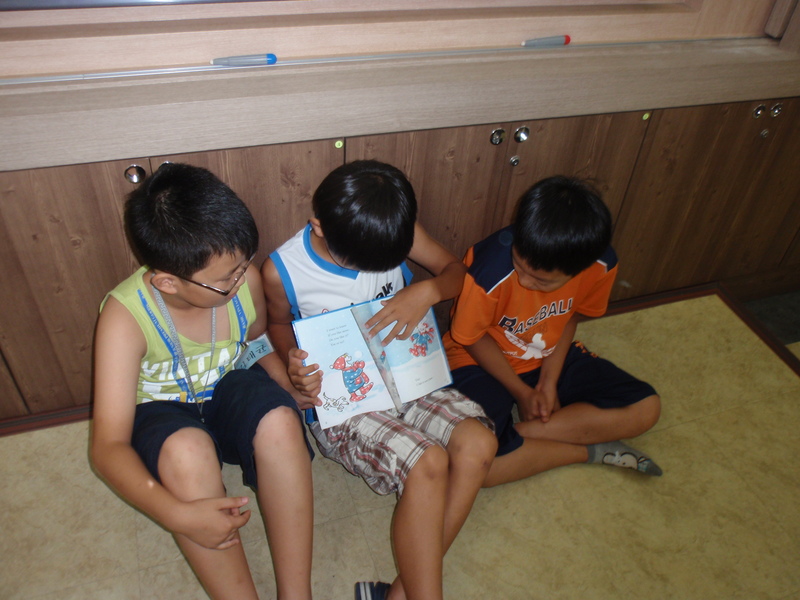 Plus, JuHye and I would rather teach separately. Today was the first day that I taught completely solo and it went extremely well. The first few days they kept saying “English stress!” at the end of class and today one of the women said, “No stress. Enjoy.” That made me feel good. 7 posts in 7 days. Can you believe it?? What’s gotten into me? Today was the first day of summer camp and I think it went pretty well. I am teaching 1st and 2nd graders this week. I was originally told that I would be teaching alone, but as it turns out, my co-teacher is sitting in on my lessons (or supposed to be) to give me a hand if I need it. I am also teaching a parents class during all 3 weeks of summer camp. I had no clue what to expect. There were 8 moms signed up for the class, but only 5 showed up today. I was surprised that 3 of the moms had a fairly high English level… two of them even had English names (Cindy and Julia). I suspect that 1-2 of the moms might stop showing up after discovering that the other moms are much better at English than they are. Time will tell. Meagan Teacher: Are you coming to my English summer camp? Student: No. I don’t have time. Meagan Teacher: What are you doing this summer? Student: I go to academy. Meagan Teacher: What do you study? Meagan Teacher: Oh. my. god. 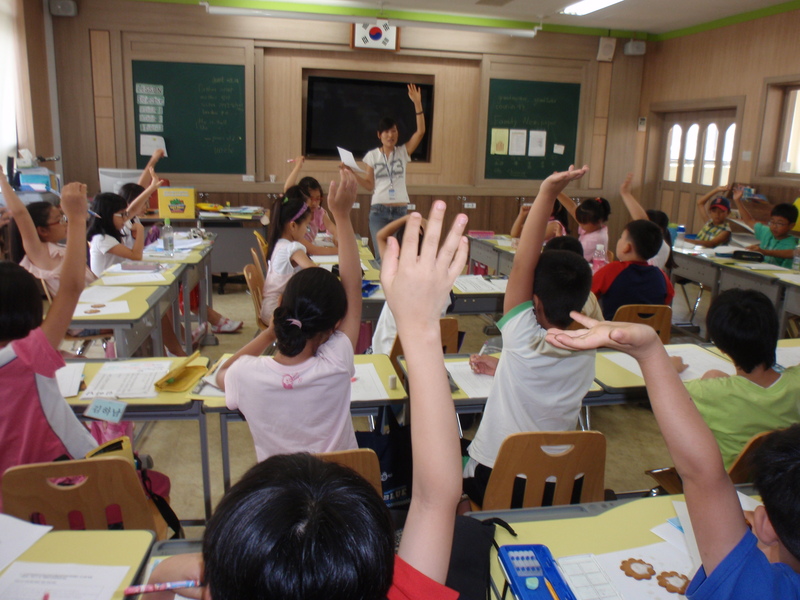 Korean students are very hardworking and study quite a lot. Many of them spend so much time studying that they don’t have time for much else. 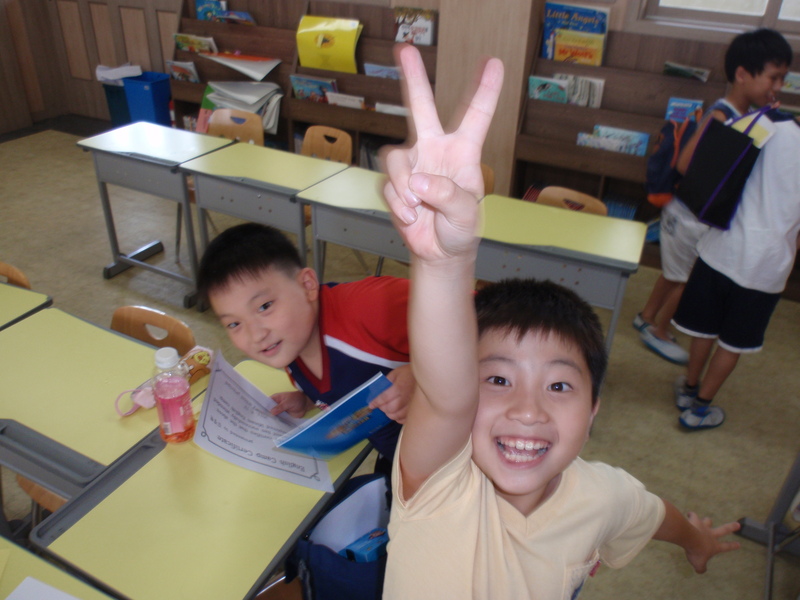 Even though it’s summer, many students will be coming to school for various camps or studying at an academy. I sometimes wonder when they have time to have fun and be kids. I teach grades 3-6 in an elementary school. Up until a month or so ago, I taught 6th grade twice a week. It was cut back to once a week so that the 6th graders could prepare for their national exam that they had last Tuesday. Last Friday was my last class with the 6th grade students until September. My co-teacher knew they had been very stressed out over the exam so she wanted me to have fun with them. We played a “Name That Tune” game using Korean pop (K-pop) songs. They were able to listen a clip of the song that used English and they had to write down the name of the song and the name of the band. They also had to list the English words that they heard. Apparently they loved it because my co-teacher told me that yesterday they were begging to play again. She also told me that she gave them a sheet of paper and asked them to write down things they thought the class was missing. 20-30 students said me. Awww!